In Europe in particular, the market for pre-cut fruits is growing every year in the double-digit percentage range. Since 1994, FOOD freshly® specializes in the extension of the shelf life of convenience fruit and vegetables. A classic example is the discolouration of apples, pears, lettuce and aubergines, which are stopped by a quick process. Not only their color is preserved, but the structure and the natural taste of the fruits is as well. Thus the shelf life of the goods increases up to 15 days. "It is important that our solutions are completely sulfur-free, unlike other products. 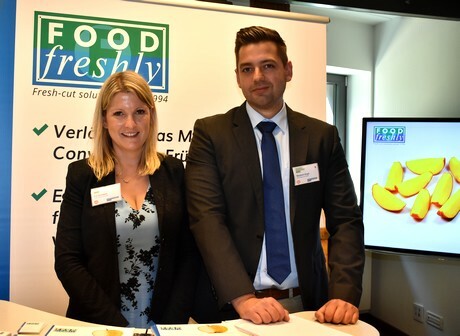 The use of sulfur in convenience salads and fruit has been banned in the EU for a very long time," explains Benjamin Singh, Head of Technical Sales at FOOD Freshly®. "Even the smallest amounts are not permitted in most cases, as they could still alter the product." Benjamin Singh:"Unlike other products, our solutions are completely sulfur-free." FOOD freshly's solutions are mainly used by processors, but also in catering, retail and food service. Singh says: "The products are easy to use and even approved for organic use, so processed organic apples, potatoes and avocados will also benefit from longer shelf life." Visit the company at Fruit Logistica (Hall 21 / C-10).